In collaboration with University of Houston, Houston based practice Metalab designed and built ‘SPACE’. A re-purposed shipping container prototype off-grid field office designed to be a self-sustained first response centre that supports rapid deployment. 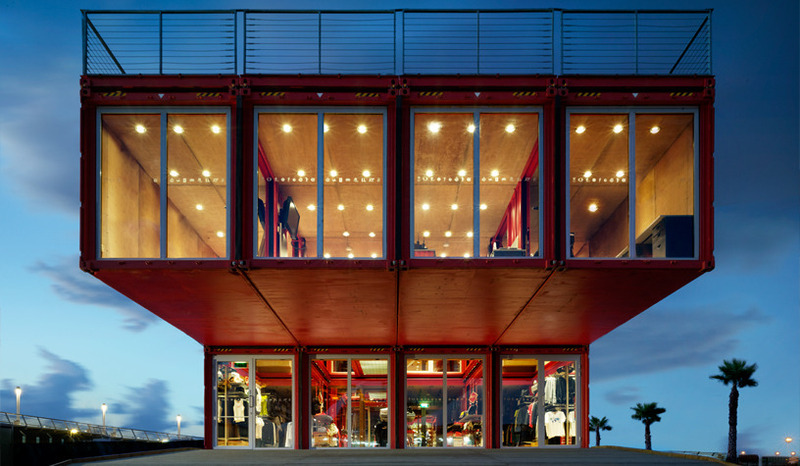 After the 2011 earthquake in Christchurch, New Zealand 27 shops made from shipping containers were re-purposed as retail premises. They were not the first container mall in the world when they were built. Other similar examples can be found in Mexico’s Cholula and Bishkek in Kyrgyzstan. Herniman Group was asked to put together a schematic design for a motel in Victoria. The brief asked for a low environmental impact solution for a motel. The design features solar panels and wind generated power solution. 53 shipping containers were used for this compact motel design. A green wall is the main wall feature that faces the main street. Development Opportunties York Avenue – Under construction !